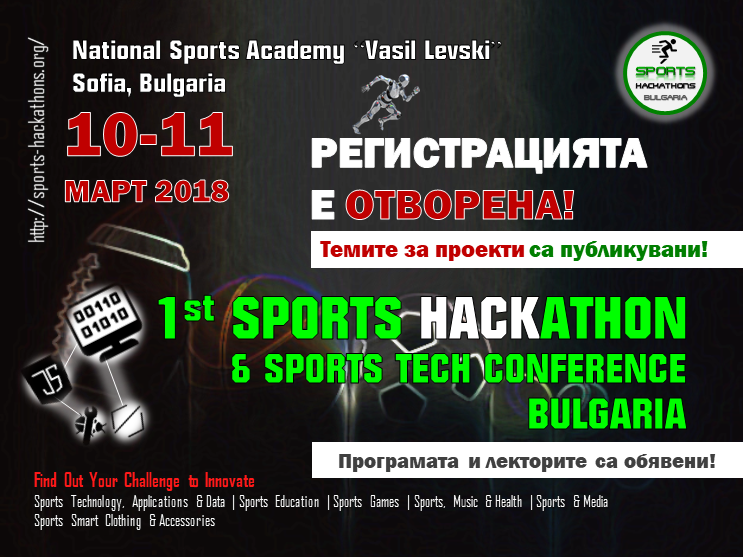 The innovative competition for sports technologies – Sports Hackathons Bulgaria will take place on 10th and 11th of March in Sofia and it is the first of its kind for the country. The competition will bring together software engineers, athletes, developers, designers and people who take as a challenge the sport, sports technology and innovations. The Sports Hackathons Bulgaria aims to create conditions for cooperation in the development of software and hardware projects for all kinds of sports. The participants are free to present projects of all kind – from designing a robot-commentator for sport games to real-time racing speed-up accessories. The teams can be up to four members without age restriction. Registration is open until March 10 inclusive. More about the rules, judging criteria, and awards can be found here. The teams will have 48 hours on March 10th and March 11th to prepare and finalize projects that can be on a conceptual level, prototype or complete solution. Within the sports hackathon, the first Sports Tech Conference will be organized. It will introduce the best practices and innovations in sports and technology to support athletes’ progress and management. The two-day event will be hosted by the National Sports Academy “Vasil Levski”. Sport Hackathons Bulgaria is organized by EduTechFlag, with the support of communication agency “Intelday Solutions”. The initiative is being conducted in partnership with the Ministry of Youth and Sports, supported by Bulsatcom and more than twenty partner organizations.